After my last blog post about simplifying Dewey, someone asked if I would share my Dewey nonfiction signs. I finally finished making the signs for Dewey 100’s (hundreds), and by signing up for my email list below you can download a FREE sample of the nonfiction signs in a PDF file. I will not use your email address to send spam or share it with anyone, and you can unsubscribe at any time. Disclaimer: This post contains affiliate links, which means if you purchase an item after clicking on a link, I will receive a small commission. See Disclosures & Disclaimers for more information. I created these signs to stick on the tall, narrow side of sturdy, plastic magazine file boxes. I inherited a LOT of them from the previous librarian, so I re-purposed them as shelf signs. The magazine boxes sit on the book shelves right next to the corresponding section of books. Update: July 2018 – I’m still using these same signs in my library with Whole Number Dewey call numbers. Check out my updated post HERE! I left a space on the 900’s sign for you to add your state or province. If you purchase the full product at my Teachers Pay Teachers Store, however, you can get the editable version in Microsoft Word, along with Canada and Australia clipart for the 900’s section. These library signs are also available in an editable format HERE, and they are part of my Elementary “On the Shelf” Displays & Signs and Elementary Displays & Signs BUNDLE products. If you already purchased one of my products, THANK YOU! You can get the editable product by going to your TpT purchases to re-download the updated files. Collette J., or Mrs. J in the Library, is a full-time elementary teacher-librarian, blogger, and mama from Pennsylvania. She loves technology, books in any format, makerspaces, and all things Harry Potter. The information and opinions represented here are her own and are not the views and opinions of any business or organization. 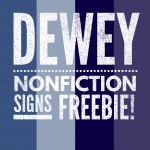 PSLA 2013 Takeaway: Simplifying Dewey…A Bold Step!